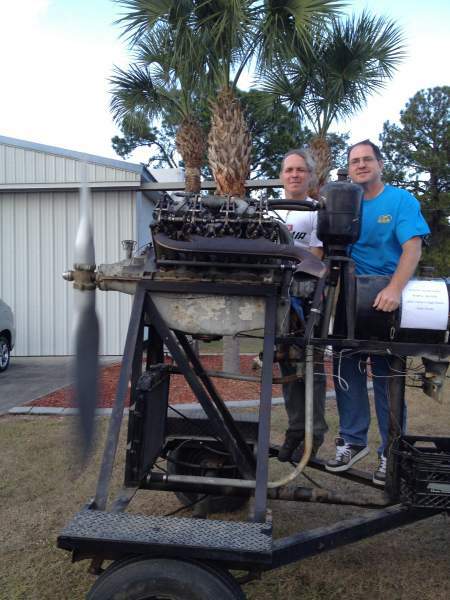 Above, Arnold Holmes,and I enjoy the prop blast of a running Curtiss OX-5 engine. This engine is Ninety-Five years old. Why do I love simple machinery? because, of the 12,000 OX-5s made, maybe 100-200 are left, but the still work just as they did nearly a century ago. These engines are great Machines. If you want to know the advantage of working with a fifty year old design, think about going to Oshkosh this year and looking at a new engine, super high-tech, purpose-built. Who knows what issues are yet to emerge by the time they make the 500th unit. Yet your old Corvair engine has 1,800,000 examples and half a century to say that GM did get it all right. That is a track record that counts more than some nifty cad drawings in a brochure. Our house has it share of broken or semi-functional items in it. Most of these are electronic devices. I understand that electronic stuff should be inherently reliable, no moving parts, etc., but they suffer from being made in the disposable era, and seemingly their designers don’t have any personal fascination with studying examples like Soviet military equipment. I don’t really have an ax to grind against technology, I am using it right now to type this. However, I think there is a lot to be said to simplicity when the continued operation of the system has high consequences. I have observed that the items in our house that will outlive me, (some of the tools, the trucks engine, 90% of the firearms, and my Corvair) were all designed before I was born. If they were animate objects, they would view my whole life as an era in theirs that passed with time. The Whitney-Jensen box and pan brake worked in a factory for a decade before I was born; the 1928 .30-06 fed a family in the depression; Graces Taylorcraft was built in Ohio by people who are just about all gone now. It used to disturb me if I dwelled on it, but today I think it is just a good gauge of what pieces of machinery in my life are worth spending time with and getting to know well. It’s a good thing this laptop can’t read and doesn’t have feelings, because it would be hurt to know that it works today, but I am going to take it to the landfill long before anyone types my obituary on it.-ww. I am typing this on a Dell computer, a model they probably made 5 million of. This computer could be called a machine, but for all intents and purposes it isn’t. A computer is another thing entirely. It is an appliance. Is there anyone reading this who thinks that there will be a single 95-year-old laptop of this model working in the year 2105? To me, the most basic division between a machine and an appliance is that a Machine is understood by a skilled operator and it is made to be maintained and rebuilt. Conversely, an appliance is likely to have a sticker that says “no user serviceable parts inside.” Almost no consideration was given to maintainability. When it stops working, almost all appliances are discarded by the consumers that used them. Note the wording: the owners were “consumers,” and the item was “consumed.” Virtually none of the users of appliances understand how they work, and the people who market them have no interest in informing them. By my perspective a Corvair engine is truly a Machine, and a Rotax 912 is really just an appliance. Our goal is to have every Corvair operator really know his engine. Contrast this with the fact that almost no 912 owner will ever overhaul his 912. If they break or wear out, the most likely outcome is that another 912 will take its place. My oldest friend runs one of the largest on-line automotive test drive and review services. He packages the reviews into broadcast quality segments that are picked up by the major news services. Because of the popularity of his product and his location in NYC, he has access to virtually any car made. This can be fun, I was with him last new years eve when he plowed a $175,000 AMG into a huge snow bank and got it stuck overnight. We have been friends since we were 13. We have never thought alike about cars: in high school he had a Datsun 280ZX, I had a V-8 Vega. In the last 35 years we have had endless discussions about cars, and by extension, Machines. The type of vehicles he likes have morphed with every new model year ever closer to being just moving appliances. It’s hard to look at them closely and see any single part that shows evidence that it was touched by a human hand, not a robot. They essentially ceased making vehicles that I would consider owning. But I have no complaint; this has driven me to develop enough craftsmanship to build my own. It has made me a happier person.